Experience the unparalleled thrill of free-falling for up to 30 seconds at awesome speeds of approximately 200kph during a tandem skydive. The Accelerated Free Fall (AFF) skydiving course is the most comprehensive introduction to sports skydiving and consists of nine stages comprising a minimum of 11 jumps. Once you have demonstrated an understanding of the skydiving skills learnt during your ground training you can progress to a skydiving jump as a TAF student. Your instructor will be attached to you and is there to assist and evaluate your jump, providing stability and a back-up to make sure you deploy your parachute at the correct height. You will initiate the exit from the plane, maintain a arched body position, check in with your instructor, check your height and practice pulling the rip cord. At 5500ft you will wave off and deploy your parachute. Once you have successfully deployed your parachute you will commence the final stage of your skydiving adventure – landing. You'll have clear air to fly through while you're guided back to earth by your Instructor, you will be controlling the parachute and following the concise instructions on how to follow the flight path and landing procedures . The skydiving parachute system, specially designed for skydiving students training jumps, comprises a ram air main canopy, a ram air reserve canopy and an Automatic Activation Device. Once the skydiving course is over, the sky's the limit! Pack a camera and plenty of courage! On completion of the day you will have successfully passed stage 1 of the AFF Course. You can organise a camera flyer on the day to video and photograph your jump. If you would like to continue through the nine stages of the AFF Course, it is available at an additional cost. STAGE 2 Revision – Training specific to this jump i.e. 90º turns, forward movement. Skydive from 10,000 feet with two instructors (not releasing) Fly your own canopy assisted by your instructor via radio..if needed!! YAHOO! STAGE 3 Revision – Training specific to this jump i.e. Arm and leg awareness, hover, heading maintenance. 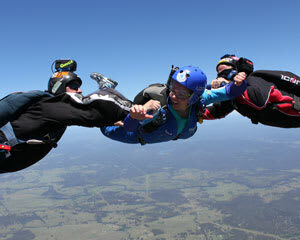 SKYDIVE from 10,000º with two instructors, one instructor will release when body flight and basic position is achieved. Canopy flight and landing with radio only if necessary. Very Cool! STAGE 4 Consolidation of stage three and revision. SKYDIVE from 10,000 º with one instructor once released student ‘hovers’ in front of instructor. Canopy flight and landing (radio only if necessary). AWESOME! By these later stages the student has shown basic position, body flight, height awareness and basic canopy control. STAGE 5 360 º turns. Forward movement and docking. STAGE 7 Back loops (extreme fun) and tracking. STAGE 9 Low altitude exit 4000º - Hop and Pop WOW! AFF course completed a few more solo jumps to gain your ‘A’ license! Go anywhere hire gear and go SKYDIVING!